When customers have a particular good or bad experience in a hotel, it used to be Facebook wall or Twitter timeline the place where to complain about it. Lately, they become used to do it directly in the TripAdvisor page, Google sites or the Amazon comments about the product. But now, if you writing a complaint in the Facebook Messenger channel of a brand, you likely will see how a bot handles it. This is the terrific opportunity for chatbots and one of their strongest advantages. Data ownership: the complaints are now arriving to a channel the business can control, that is, they can check the logs, knowing they only talk about their product or service, unlike social media platforms where the message gets mixed with other conversations. Avoiding blackmail: It is a private channel, so there’s no risk of other users taking advantage of the situation of one of them and complaining only to blackmail the business. CRM connection: you will not have to manually check if a person is a client or not, their product reference number, the status of their delivery… all those steps are automatic in the case of a bot. So giving away a compensation to someone who doesn’t deserve it is another avoided risk. So, if human input in a human-chatbot conversation is the new complaint in social media, how about applying what we were applying to social media messages? 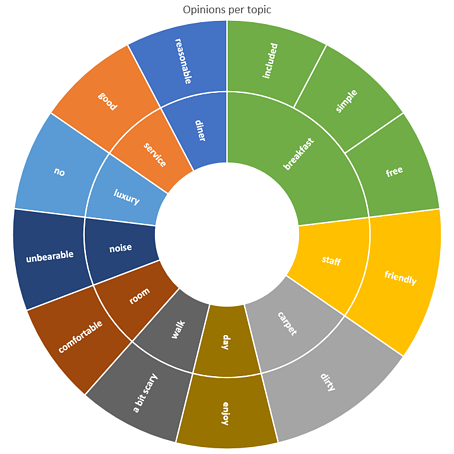 That is, sentiment analysis for bots conversations analytics. 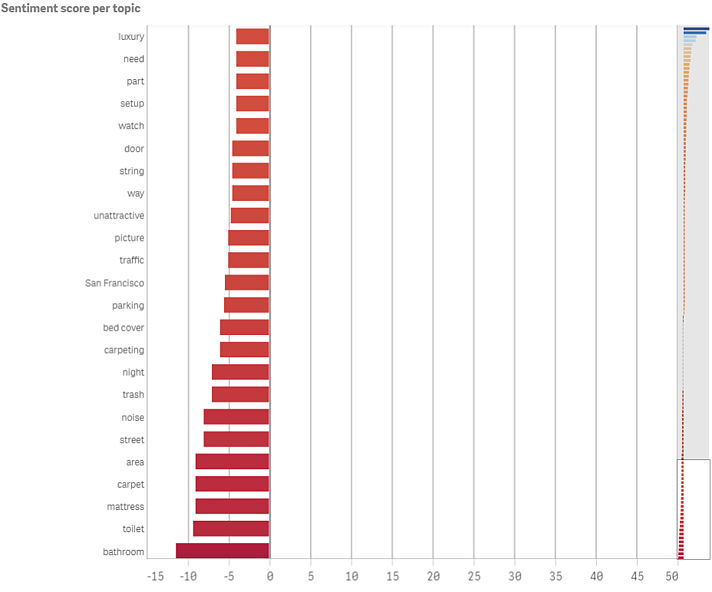 As a picture is worth a thousand words, we manually collected negative and positive reviews (not much, only 93 paragraphs) from TripAdvisor about a bunch of hotels in San Francisco, and applied the Bitext sentiment API to see if some insight came up from the graphics with such a scarce dataset. The results are truly enlightening! Sentiment analysis would be a powerful tool for a hotel manager to know their business' strengths and weaknesses. For example, if these comments belonged to a single hotel and you were in charge of it, of course you shouldn't worry about the staff, the breakfast or the wifi, instead you should pay attention to whatever happens with the bathrooms (bathroom, toilet) and the maintenance (carpet, carpeting, bed cover), or think about soundproofing (area, street, noise, night, traffic). Another interesting relation that can illustrate what customers think of a service, beyond negative and positive scores, is the opinions per topic. 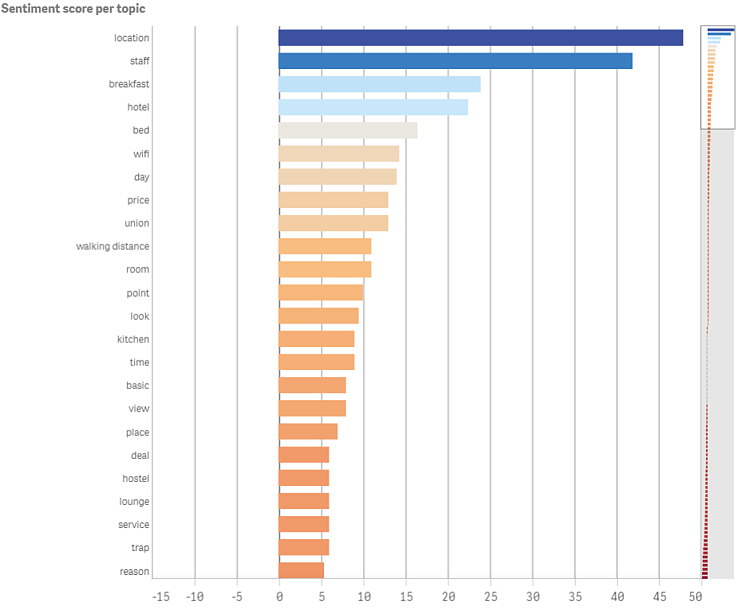 It allows to see what topics are more popular, no matter the score and also the specific words used to describe each topic. This is gold for the hotel communication team to know if the message they’re sending corresponds with their customers’ real experiences. As you can see, these variables give you a lot of possibilities. 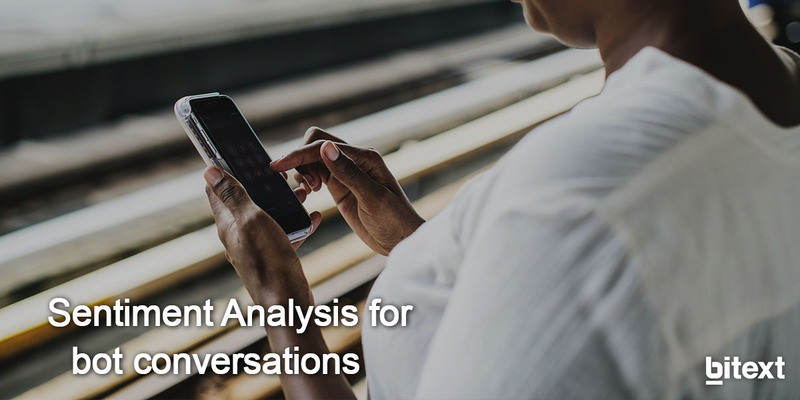 We encourage you to try it with corpora representative of different activity fields, sizes and languages (ES, CA, FR, DE, IT, PT, NL) and share the insights you extract.